As I left my hotel, it was raining on the tables where I had drunk my coffee yesterday morning. Winter had returned. I had breakfast inside. As I walked out through the suburbs, I suddenly noticed a funny, furry little creature coming towards me with an odd gait. It sniffed at my feet. What was it? A dog? A cat? No, it hopped. it was a pet bunny. It hopped away onto the road, and then after a near miss, back onto the footpath and into a front yard. It was going to get run over. I rang a couple of bells, hoping to find someone who knew something about it, and just when I was despairing of finding its owner, a woman drove up, stopped her car in the middle of the road, leapt out, and said in a panic, "My rabbit, my rabbit!" She was in a hurry, and was almost too late. I had a coffee at Fontaine le Compte, and soon after that, ran into construction again. The detour took me down the main highway, and then back onto the trail. For the rest of the day, I walked on dirt roads through woods and fields. Unfortunately, the track was wet after the rain. In places, it was a muddy puddle; in others, it was a bog. Sometimes, it was difficult to get traction on the slippery surface. Sometimes, I had to wade through the long grass. In higher places, the footing was firm. The weather was as varied as the condition of the track: storm clouds, then patches of sunshine, then sudden squalls, then rain, and even hail, pounding on my Tilley hat like gravel on a tin roof. I passed a large field of peas. This time, they were in flower. Next time, in a week or two and further south, perhaps they would be ripe. All across the fields and in the woods, I noticed little platforms built out of two by fours to raise up the hunters so they would get a good shot at the deer or wild boar. Everywhere I walk in France, I see references to the hunt. "Chasse Inerdit" or "Reserve de Chasse". These do not mean that hunting is forbidden, but that you can't hunt there unless you belong to the hunters' association that has the rights to the land. Another sign is quite common as well: "Reserve de Chasse et de Faune Sauvage". Naively, I used to think that this meant that the deer were protected, and indeed they are, until a certain time when it's considered necessary to cull them, and then, the same association will shoot them down. Actually, "chasse" is a misnomer. There isn't any "chasing" involved, just as there usually isn't any "hunting" in an English hunt. Indeed, the chasseurs don't move at all. Instead, they sit on their stands, absolutely still, and blast away. Unlike other villages on the rivers and streams, Lusignan is on a hill. When you finally arrive, you still have a killer of a climb up to the old centre. I was too late to explore much of the town. I walked by the 19th century halle, and I visited an impressive Romanesque church. Tonight, I am alone in a very fine gite, three rooms with two beds each. 8€. I had breakfast at the hotel where I had eaten last night. The landlord was more pleasant than his wife. She, perhaps, had been a little resentful because I had stayed at the gite and not her hotel. I am full of admiration for the mairies of these little communes which provide a gite for the pilgrims. They certainly don't make any money; in fact, they must barely cover their expenses, considering the cost of heating the old buildings. Nor do I see how they can claim that they are doing a service to their community. One or two pilgrims a day might each spend up to 20€ perhaps at the shops and restaurants. Pilgrims are not big spenders. There remains only one reason why the mairies do this. They must feel that they have a responsibility to look after the pilgrims who pass through their towns, not so very different from the religious responsibility of the church in earlier times. They are very careful to establish that you are a bona fide pilgrim: they stamp your creanciale and take a photocopy of your passport. To me, it is another example of the curious ambivalence of secular France towards the Church: it is not their faith, but it is their heritage. I took a chance on the weather, overcast again, and wore my shorts, leaving off the rain pants. Later, I was to regret this. Chauvinist that I am, I do not think that French has too many linguistic advantages over the language of Shakespeare. We have twice as many words, and most of them can twist themselves into various Protean shades of meaning. But once in a while, the French beat us at our own game. As I made my way out of town, I was told by my guide book to "obliquer a gauche". What a useful example of a verb formed from an adjective! Much more common, and used by everybody several times a day, is the verb "longer", to go along. It is so useful, and a verb we could do with in English. On longe la rivière. In English, we can long for something, or long to do something, but we can't long a river. We have to go along it. My guidebook tells me, on a long section where there is nothing much to see, to "laisser vagabonder mes pensees". And that is exactly what I do as I walk: I let my thoughts vagabond. I was going to coin that word myself, but my dictionary tells me it already exists in English. My thoughts were vagabonding as I walked through the bocage, a region, now rather rare in France, characterized by small fields enclosed by raised hedges. Unfortunately, large scale agriculture prefers very large fields without any barriers to their machines. But in this part of the country at least, man is in harmony with nature. The hedges prevent erosion, the ditches provide natural drainage, and both provide homes for birds and animals. I remember reading somewhere in classical literature, that the golden age was a time when men lived in their own villages in harmony with nature. In successive ages, they began digging minerals from the earth and leaving their homes to invade other lands. As I walk by these small fields and see old stone houses heated by the cords of wood stacked up outside, I am reminded of that golden age. In one of the hedges enclosing a large estate was an old gate in front of a long lane leading up to a chateau. Then I came upon a farmer pottering about in his field. He pointed to the sky, indicating that it was going to rain. I hoped he was wrong, but he wasn't. On a wet trail, without any shelter, I had to do my "rain dance". It is not possible to put on my rain pants over my boots, and therein lies the problem. I have to take my right foot out of my boot, and put it into my right pants leg, and then back into my boot, all the while balancing on my left foot. Then I repeat the process with the other foot. If I lose my balance, I have to either put my sock down into the wet or topple sideways into the mud. I have seen the source of the "scarecrow" explosions. A device, rather like a cannon, is fuelled by propane. I'm still not sure whether it fires at regular intervals or at random. At the village of Saint-Sauvant. I saw a fine old building put to good use. Nicknamed the chateau, it was built in the early 20th century by a self-taught local boy who made good. The commune was now using it to house their library. I arrived at two o'clock at Chenay. There is nothing here, not even the gite that I had expected. And the hotel was closed. I was directed to a chambre d'hôtes on the Place de la Mairie. Here, I have eaten well, and I have comfortably settled in to a large room under the roof. I ate well at the gite last night. It was one of those meals where I wasn't sure whether the second course was the main course or not. You can't ask. It's like saying, Is that all there is? The hosts have lived in the village of Chenay for 52 years. Before that, he lived a few kilometres away in one direction; she, a few kilometres away in the other. They met in the middle. Sadly, the village has changed since they married. Once it was bustling with commerce. Now there is nothing. I asked if she'd like to visit Canada. "It's a long way away," she said. The soup was followed by a dish that consisted of sausages mounted on a base of apple sauce. I took one, and then was offered another. The dilemma: was this the main course? If so, the meal was a bit Spartan, but then some people eat very simply. Did I say no, and risk going hungry, or say yes, and risk being full for the main course? I said yes, had a second sausage, and then waited for the next plate. It was a dish of canard magret, fillet of duck, and was followed by a plate of local cheeses, and then dessert. I ate like a king. I recommend this chambre d'hôtes. I have left the bocage behind. Instead, I walked through wide open, gently undulating fields of grain. At the cemetary at La Martiniere I noticed a plaque on the back of a large tombstone, facing outwards so that passers by could read it. Erected by his friends, it was a memorial to a former mayor who had died in a Nazi prison camp. In the bus shelter, I ate the duck sandwich I had been given by my host. Why was I eating in a bus shelter? Because it rained all day. I arrived in Melle, drenched like a drowned rat. I've been without Wifi for a few days, but in the town I found a bar and got hooked up, so to speak. Reading the Globe and Mail, I noticed that the stories hadn't changed that much: Mike Duffy, Rob Ford, and the pipelines. I was glad to see that opposition is growing to the latter. I visited the Romanesque church of Saint Hilaire. Particularly striking is the series of apses around the choir, each with its triangular roof. Taken in the rain, the photo doesn't do it justice. Also impressive is the statue, above the door, of a man on horseback about to crush a figure cowering beneath. One theory has it that the statue represents the emperor Constantine about to crush paganism. A bit grim! I had decided not to stay in Melle, as it was only 16 kms from Chenay, but to move on and to cut a bit off the long walk tomorrow. Just out of Melle I passed a ruined chapel. Perhaps it would end up as a farmer's shed. Sad! Mme. Nau had recommended that I stay with the sisters at Saint-Romans-les-Melle. I hoped it would be a bit different from my last experience at a religious establishment. It was. There was no girl with a plunging neckline to greet me. Instead, I was welcomed by a couple of nuns well into their ninth or tenth decades. Another sat in a wheelchair. The two had been expecting me, but didn't quite know what to do with me. They kept muttering, "Where is she?" and disappeared from time to time to look for someone. Then for something to do, one of them took me up a couple of flights of stairs to show me where I could have a shower. Not that I could have one before I had a room. Finally, the mysterious person arrived. She gave me a smile, but I had the impression that she would rap my knuckles if I got my sums wrong. She was obviously in charge, and took me to my room, which was in a kind of gite attached to the main building. It was slightly warmer than outside. I decided to have my shower right away. I climbed the two flights of stairs and entered the bathroom. It was in keeping with the rest of the building, straight out of the nineteenth century. The washbasin was tall and narrow with rusted fittings. The curtain on the window was once green, I think, but now was brown. The chasse d'eau didn't work, which explained why the toilet hadn't been flushed. It didn't augur well for the next pilgrim. The shower worked, but the pipes gurgled as if protesting at being disturbed. The water was reluctant to leave by the plug hole. Back in the gite, I relaxed on the bed, and looked around.Two circular tables with ancient cloths took up most of the room. A couple of old armoires stood against one of the walls, and Mary looked down on me from the top of a cabinet. Opposite, was a unicorn on a huge tapestry. Twin doors on the third wall led to a kitchen and toilet. On the fourth wall, under the window, sat a large radiator. I was cold, so I decided to experiment with it. It was lukewarm. I turned the knob at the end and hot water began coursing through the pipes. I felt naughty, and was afraid I might get into trouble if I was found out. After a while, I noticed a damp, musty smell, and my eyes began to sting. Evidently, the room had been left unheated in an effort to save on costs. Perhaps my turning up the radiator would dry everything out. I decided to leave a generous donation if the meal was up to scratch. It was. At two minutes before the scheduled hour, I was summoned. The sisters were sitting around the table waiting for me. Now they numbered six in all. We had soup, followed by a salad, and then chicken and roasted endives, cheese and desert. They didn't eat much, but they were concerned that I did. A bottle of wine was at my place. They were interested in Canada and the Chemin. One of them had spent time in Montreal. Another had been to some of the places I had visited, including the magnificent cloister at Moissac. Eventually, I sensed that it was time to leave. They weren't in the habit of lingering over supper. I wouldn't want to put anybody off. It was a bit primitive, but the sisters were most hospitable. I ate well, and I felt more welcome than I had at Foyer Notre Dame de la Trinite. Two mishaps, an act of kindness, and three or four strokes of good luck! I went in for breakfast precisely at seven, and one of the sisters was waiting for me. She was a friendly, gentle soul, and we chatted over breakfast. I had thought that the old house must have been a home for old nuns, but no, they were still very active. I had been feeling sad at the thought that they were all alone in this retirement home without any family to visit them, but no, she assured me that they were still very busy with their garden, their meetings, and their work with the aged, who must have been younger than they were. I left with the impression that they weren't experiencing any regrets at their present predicament. Having made a detour to stay with the sisters, I headed east and rejoined the GR. Engrossed in a telephone conversation with my dear wife, I somehow missed a sign, and obliqued in the wrong direction. To cut a long story short, I lost any advantage I had gained the night before by venturing a little way on today's journey. Finally, I arrived at Brioux-sur-Bouronne, and had a coffee at a bar with Wifi. Its regular clientele were much younger than I, but the young man obligingly turned down the loud, unfamiliar music. I continued on. At Villefollet, I sat down and ate my lunch on a bench in front of un terrain de boules, an area of ground where the French play pétanque, their game of bowls. Various posters informed me that several tournaments were coming up, but now, all was silent. I could see with my mind's eye the old men throwing the metal balls as I had seen them so many times in village squares. And I could hear their metallic clink. A couple of days ago, I had laughed at a sign which prohibited the playing of boules after ten o'clock at night. The residents must have had trouble getting to sleep, not because of young people with their rock music, but the old with their bowls. After lunch, I telephoned to reserve a place at the gite, and congratulated myself on carrying out a successful conversation on the phone, a difficult task for me. Then I pressed on. An hour later, I couldn't find my phone! I must have left it on the bench at Villefollet. A piece of folly indeed at that town! What to do? I decided to ask the next person I saw to drive me back. Or perhaps I would find a taxi. I had noticed them from time to time on the highway. A little later, the GR crossed a busy road. I waited for five minutes. No taxi. I gave up and walked on. I now entered a forest, the loneliest part of the chemin since Paris. A beautiful walk, but I was too anxious to enjoy it. I must have walked for another hour before I arrived at Villedieu. Deserted. Then I saw a man leave a house and walk out to his truck, a tiny little Citroen. I ran up to him and started to explain my problem. "You want me to drive you?" he said. He was a short, rather chubby, somewhat unshaven man, and, as I was to see, very gregarious. I was optimistic. It would still be there. The terrain de boules would be deserted until the next tournament. But when we arrived, half a dozen people were sitting on the bench. And no phone. My driver knew most of the players and there was much shaking of hands. He explained my predicament. Everyone jumped up and down and looked under the bench. Still no phone. I was most apologetic at having wasted his time. Then someone suggested phoning my number. He did, and someone answered. She had my phone, and would meet us at the Mairie. All the joueurs de boules were most excited. They had taken on my problem as their own. And so had my kind driver. He was quite happy to wait at the Mairie for perhaps 15 minutes before the woman arrived. As we waited, various people drove by in cars and on tractors. More shaking of hands. He knew them all. And then she arrived. She hadn't found the phone under the bench. She had found it on the chemin, the GR. It must have dropped out of my pocket somehow. Or rather, her dog had found it. She had been out walking her dog on the path I had taken. He must have thought it was a piece of red meat. I thanked him profusely. He was in the back of the car. She had been planning to take my phone to the Mairie next time it opened, which was only once or twice a week in these little villages, and wasn't going to answer the phone, because she didn't know how. But something made her open it up and she pressed various buttons. She was as happy as I was at the outcome. She had a daughter in Halifax, and loved Canada. My Good Samaritan drove me back to Villedieu, and offered to drive me the extra five kilometres to Aulnay. I declined, and tried to pay him for everything he had done for me. He refused and drove off, and I walked on, reflecting on the kindness that he and the others had shown me. For all of us, this would be a petite histoire. For me, as I'm recounting it to you now. For the lady who brought back the phone, to her daughter in Halifax. For the joueurs, for whom it might have been the big event of the day, or week. And for my driver, who helped out a pilgrim, and would tell the story to all his mates. Now here's the thing. I hadn't seen a rambler or a dog walker on the chemin for three days, but she happened to be walking along at that time with her dog. And he happened to draw her attention to my phone. And she happened to reply to the ring. And, of course, I had happened to find someone willing to drive me. At Villedieu, just before I found the kind man who drove me, I had met another pilgrim, Frank, a Parisian. He had been most sympathetic to my plight. I ran into him again at the gite, and we had a beer together. He is a croyant and was most interested in my story. "It's the magic of the Camino," he said, "a miracle. And the name of the town where you found your driver? Villedieu!" After yesterday's marathon effort, I was sluggish today. No grand events to report! I didn't lose my phone and I didn't lose my way. It would have been difficult to get lost in the Departement de Charente-Maitime, where we are now walking. Big concrete blocks embedded in the ground and displaying the coquille indicate any change of direction. After breakfast, I visited the Eglise Romane Saint-Pierre-de-la-Tour. 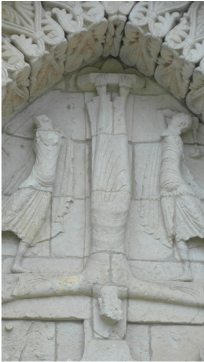 Outside, some of the carvings are eroded, but there is an interesting statue of St. Peter crucified upside down. Inside, the carvings on the capitals of the columns are well preserved and quite magnificent. Sorry if you are thinking "another bloody church". As I walked out of town, I passed la Rue Sans Soleil. That was a bad sign. Later I passed a farmer making hay. That was a good sign. I walked at a leisurely pace across the high plains through fields of oats, wheat and barley. The sun came out and I enjoyed the beauty of it all. The brilliant red poppies along the edge of the fields stood out against the yellow background of the canola flowers. In the trees I could hear the song birds, and above the fields, the larks. A harmony of colour and sound! I miss the maggies and the gum trees, and I like walking in the Canadian forest, but nothing matches the beauty of the European countryside. I also met a couple of friendly dogs and saw sundry farmyard animals. Just before Saint-Jean I passed a very plump lady cutting some very long grass in a very large yard. In the centre of the yard stood her husband dressed in a pink shirt and red velvet pants. Why was he just watching her, I thought. Why wasn't he helping, the lazy bugger? He didn't move. He was a scarecrow. I am staying tonight at the European Culture Centre which is housed in an old abbey. I am sharing a room with Frank the Parisian and another pilgrim who has just arrived from Brittany. They will leave me behind tomorrow. Normally, I would be walking 35 kms tomorrow to Saintes, but I have decided to break this step in two. The Office de Tourisme has reserved a place for me on a farm halfway. I have written enthusiastically before about the Offices de Tourisme. Since then, I have found one or two who were less than helpful, but in general, they have offered to book ahead for me. I will telephone if I have to, but sometimes I get someone at the other end whom I can't understand, and I don't know what I'm agreeing to. So I always accept their kind offer. Yesterday, I plodded. Today, I ambled. Tomorrow, I will stride. Tomorrow, I will leave early and hurry to Saintes, hoping to arrive by midday, leaving time to visit the town in the afternoon, for there is much to see. Today, I ambled, for I was splitting a long step in two. I was in no hurry and enjoyed the pleasures of the walk. As I walked out of town, I crossed over several little streams which were separated from the main river I was soon to cross. On either side, houses backed up against the stream, jutting over, having easy access in the past to drinking water and probably sewage disposal. With the warmth of the sun on my back, I reached the open countryside. Wind turbines turned lazily on the horizon and a hawk circled overhead. Later in the morning, I saw a flying scarecrow at close quarters. This one, anyway, worked only in the wind, lifting off the ground at the slightest breeze. I walked across fields, along brooks, and through woods, coming out of the wilderness every so often to pass through a little village or hamlet. The first sign of life is always the church spire pointing up to heaven, and to me it is a symbol of life, of past faith, but also of community and civilization. The Church, for all the malpractices of its members, must also be credited for keeping knowledge alive during the Dark Ages; and man's intellectual, artistic, and even scientific, exploration have evolved out of Christianity. These thoughts led me to reflect, for I had lots of time for reflection, on a piece I had read this morning, holding religion responsible for the oppression of women. It is not uncommon for critics to hold religion responsible for all the evils of the world, from the supression of women to the subjugation of other human beings of a different race or creed. In fact, it is not religion, but the men who have practised it, exploited it, and interpreted it after their own fashion, who must be held to blame. Their self-interested practices evolved into that institution which in Western Civilization became known as the Church. Vitriol should perhaps be directed at the Church, not religion. But indeed, those same members of the patriarchal society dominated other institutions as well, shaping them to justify their actions and affirm their superior position in society. Secular society of the past oppressed women in all its institutions. Religion is a set of beliefs and actions practised by a group of people. Today, in the mainstream Protestant denominations, women are equal, even dominant. Many of these congregations have turned themselves into food banks, getting back to original teachings and exercising Christian charity. Heavy with dogma, the Catholic Church has found it more difficult to reform. Yet it no longer prays for the conversion of the Jews, or preaches hellfire and damnation. Limbo has slipped into oblivion. Purgatory cannot be far behind. That nineteenth century accretion, the infallibility of the Pope will soon be on the way out. I'm sure that Pope Francis doesn't believe that he is infallible. Contraception is permissible under certain circumstances. Married priests are already accepted into the clergy if they arrive from outside, and the whole unnatural practice of celibacy has fallen into such disrepute that it must surely be abandoned in time. Especially if the Church hopes to recruit priests. That is the institution. In the meantime many Catholics, I am sure, are practising a religion which holds men and women as equals, and are themselves working for change in the Church itself. To rail against religion is unfair to those who live by these principles. I spent a very comfortable night at the gite. I was alone in this huge establishment, a former farm, capable of holding 30 people at a pinch. No likelihood of being turned away there. He was a former viticulteur, a producer of wine, and he had evidently done a fair bit of sampling in his time. He had a florid complexion, and tossed back his aperitif with a flourish. She was garrulous, talking non-stop about the excessive demands of her aged parent. But after giving me a reasonable meal with wine and aperitif, and doing my washing, and giving me a comfortable bed, all they expected was a donation. Some impecunious pilgrims would have given them only five Euros, but I gave them a fair amount. As I walked out of town, I passed one of those massive railway stations, of grander proportions than one would expect in a little village. The railway, too, was an institution that believed "by your works, ye shall be known", and took pride in its architecture. Once this station would have housed a station master, his family, and perhaps a ticket collector. Now it probably had an automatic ticket dispenser. I am now passing through the region of cognac and pineau, and the signs for these delightful products are everywhere. I learned last night that cognac is distilled from white wine that is not suitable for drinking. I quickly walked the few kilometres along the highway to join the Chemin at Juicq. Then it was down a limestone road to a narrow hollow trail through the woods which may have been the old pilgrim route. It had an air of antiquity about it. After that it was up and down, and in and out of woods. This route is getting better and better, as we spend less time on the bitumen, and more and more on minor limestone tracks or in the woods. For the most part, the Chemin de Saint-Jacques, marked by its concrete bornes, follows the GR, but from time to time the latter wanders off on its own. A few days ago, I was walking along a road, and the GR took off around a square field to join me a little later. I had walked along one side of a square; the GR had followed the other three. As I approached Saintes, the trail became quite hilly, and I thought it would have been a real killer for those people who were walking from Saint-Jean to Saintes in one step. Situated on both sides of the River Charente, Saintes is a delightful town. Hosting 16 churches and associated hospices in the Middle Ages, it was an important pilgrim assembly place. They would enter the town and cross the Charente by an old Roman bridge, of which only the Arc de Germanicus remains. To me it looks a little out of place, standing alone on the bank of the river. The spire of the cathedral dominates the town. The most remarkable feature is the ruins of a Gallo-Roman amphitheatre, which unfortunately was closed when I went to visit it. I am staying in a refuge attached to the Eglise Saint-Eutrope, a church with a mighty spire and a huge crypt. There are six of us occupying three double bunks: three Spanish cyclists, one English cyclist, an Italian foot-pilgrim and I. As I type these last lines before I go to sleep, I feel that I'm back in Spain. The Spaniards are snoring, one rumbling bass, a baritone, and a tenor.